Be the Belle of the Ball at your next social event with these great statement pieces from Plukka that are guaranteed to give you that extra creative edge and spice up any look. Whether you are out on the town enjoying the buzzing Dubai scene or dressing up for a classy family gathering, Plukka has the it-pieces you need to help you wow the crowd and shine bright like a diamond. This stunning platinum cocktail ring carries a motherlode of 13.75 carats of Zambian emeralds, interspersed throughout with diamonds to bring out their vivid fire. The bombé curve of this large-scale ring adds even more impact to this heirloom-quality jewel. 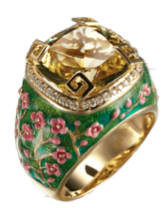 This richly whimsical lemon quartz ring features a 7.50 carat lemon quartz center stone rimmed by diamonds, and a grass green enameled shank delicately sprinkled with fuchsia flowers. This luxurious two-part ring, comprising two diamond-set rings, combines classical marquis-cut diamonds with a fanciful design which suggests the tail of some mysterious creature wrapped around the finger in a single, unbroken curlicue. These 18K rose gold earrings feature very large brilliant-cut rose quartz stones of over 40 carats each "wrapped" in ribbons of diamonds and rose gold. The effect is unabashed luxury and femininity. A perfect compliment to the single stud pearl ring this classic but powerful piece of 18K yellow gold jewelry provides an iconic centerpiece to the collection. A subtle reminder of time together, time apart and time to come. This astounding jeweled collar of over 220 carats of semi-precious stones will make you the center of attention at any black-tie affair. 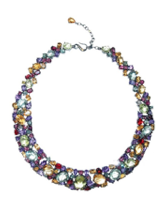 Large faceted amethysts, tourmalines, citrines, rhodolites and lemon quartz are nestled among smaller stones on a semi-flexible sterling silver collar. Plated with black rhodium, the silver setting becomes invisible, revealing the glittering beauty of this treasure trove of gemstones.